Batangas is such a beautiful place for a once in a lifetime wedding. Taal Lake and Tagaytay are there to woe you with the two of the most pristine views in the Philippines. These travel destinations could be your future wedding location. But of course, if you are planning to have a wedding, you do not only look for locations. You look for good food as well. In that, Batangas also do not disappoint. There are many good catering services in Batangas. All you have to do is to find the best among them all. It is always hard to look for and have the best. Luckily, it is not like that if we talk about catering services in Batangas. There are ways on how to actually find the best of the best catering service that is applicable for your needs. Canvass and list your options. Canvassing for options is always going to be the first and the crucial part of looking for something. You are not going to settle for that catering service recommended to you by your friend because that is also her friend. You are going to settle when you find the best. So, know your options and start from there. Prioritize the food! A common catering service do not care about the quality of their food, but the quantity of their servings. With that it is very crucial for you to focus on food quality over quantity. You will get a catering service in your wedding to make your visitors feel your gratitude by spoiling them with good food. Not to make them regret that they have eaten in your wedding. Make sure to schedule a food testing session. That way, you can assure the quality of their food. If they do not allow a food testing session, that is a big no-no. The package price matters. After the food comes the price. That’s how your priority is going to be. Look for a catering service that closes the deal with a reasonable package price with the promise of good food quality and adequate quantity of servings. To know if they quoted a reasonable price, compare the prices of all your candidate catering services. Choose a catering service with a presentable setup. The setup includes the personnel and their proposed design of the reception are. Well, some catering services include the design of the reception area to their service package and some do not. 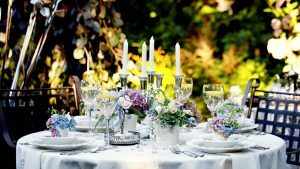 Given that your candidate catering service includes the reception area designs, make sure to check their designs in their past wedding services. Choose the design that suits your wedding motif and theme. Another point is their personnel. Ask if they have uniforms and if those uniforms will coincide with wedding motif. You should not miss a single detail even if those are only colors. The wedding cake should be perfect. Securing a beautifully designed cake is one of the big tasks of your catering service. They should be able to give you a wedding cake that would represent how simple and at the same time, prestigious your wedding is. Well, this is only applicable if you would let your catering service include the wedding cake in their package. You can always choose not to include it in your package. But if you do decide to let your catering service handle the preparation of your wedding cake, make sure to convey to them what a perfect wedding cake for you is. A wedding is a once in a lifetime event that should be perfect. That is because it is the only time in your life that you can shout to the world how much thankful you are for having that love at your side forever. With that, it is crucial not to let such a simple task of catering for your wedding destroy that precious day. Again, make sure to canvass for options. Make sure to prioritize food quality over quantity of servings. Make sure that the package price is reasonable. Make sure the catering setup on the wedding day is presentable and organized. Lastly, make sure your wedding is representative of what you want that day to be. Batangas is going to appear small compared to many urbanized cities around the country. But little may this humble province seem, it can always be proud of all the catering services they have around. Good luck choosing!